Discussion in 'General Airgun Chat' started by NarkyMark, Apr 21, 2011. 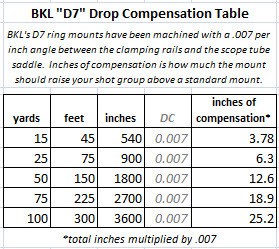 I am trying to get my head around the effects of Drop Compensation mounts to my perceived (seen) trajectory, The ones I have seen are the BKL 260 D7's, from their listed specifications I have calculated that they equate to 10.8 MOA at 45yrds, but what is this figure in real life terms (or in my case layman terms ) and is there anyway I can input these figures into CG to see for myself? I'm not how to do it except to suggest that it might just shift your aim point up 10.8 MOA at 45 yds... which means your turret would have to be turned down 10.8 MOA from it's current position at 45yds. If you can use two peice, adjustables like the sportsmatch will allow it to be spot on. Are they 30 or 25mm mounts? Sorry Rob replied as you did! I did think that would be the case about rising 10.8 MOA, as my current setup is around 4.5MOA @ 45yrds all it would appear to do is shift aimpoint above my crosshairs! Thus creating more of the same headache but the opposite way around! I'm presuming they are 1" mounts as they are from 200 series but it does not actually say?